Hey, that tastes good! : See ya! Hey guys, Alex and I are going on vacation! By vacation I mean going to Europe to visit Alex's family, with a side trip to London and a quick stop in Iceland on the way home. I am excited. See that picture above? 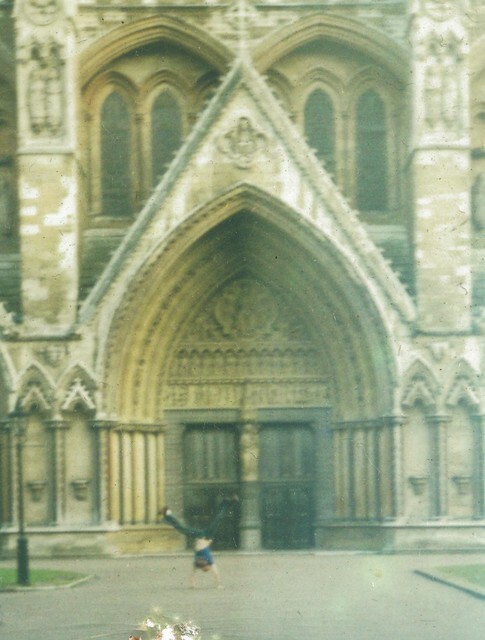 That's from me doing a cartwheel in front of Westminster Abbey sometime in the mid 90s. Anyone got any gluten free restaurant recommendations in London, Budapest, or Reykjavik? The Carluccio's chain does nice simple Italian food and has a gluten-free menu. No pizza, but there's a wide selection of gf pasta dishes as long as you don't mind that it might be penne, whatever the menu description says! Many choices in London. Bella Italia is also a chain with GF options - pizza and pasta. Most restaurants have heard of GF and either have a menu or can tailor something. Do be cautious if you go to Cafe Gerbeaud, one of the more popular coffee houses in Budapest!I got different information from different people each time I went. My favorite place in Budapest is Castro Bistro a really great Serbian spot at Madach Imre ter 3. Wagamama is a chain in London that is very GF friendly. Also, Cotto in London is amazing for GF food. They have tasty pizzas, pastas and a ridiculous Tiramasu. We had breakfast at the Mandarin Oriental where they had GF bread for toast. If you ever travel to Santa Barbara, visit glutenfreeinsb.wordpress.com for GF restaurants! Ok, so dish - how was the trip? Any gf recommendations?